Perhaps, I have done this all wrong! Maybe I would have served you better if this post had been my first in this series to help you get organized to create your optimal health. I say that because a focused mind plays a critical part in your success to create a healthy lifestyle for yourself and your family and it really is your foundation for getting it right. 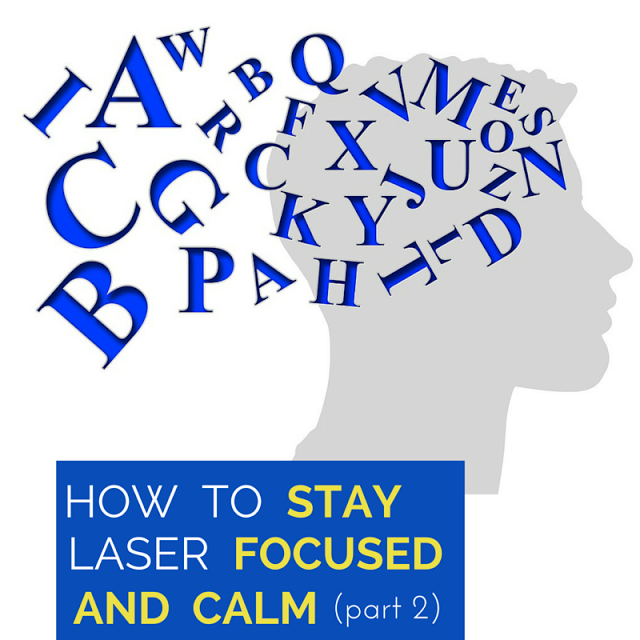 It is true that I have discussed this topic before at THM, but let’s zone in more heavily now with many strategies and ideas and see what we can do to laser-sharpen our focus and enhance those beautiful brains of ours that sustain us in every way, every day! 1. Impulsivity can show up on the scale. This recent study showed that a disorganized and impulsive mind can even pack on more than a few pounds. That only makes reaching our healthy lifestyle goals all the more challenging. 2. Our mood affects our energy levels. If we are feeling low, we hardly feel like lacing up those athletic shoes and hitting the gym. Even though it can be the very thing that can elevate us, it is more difficult with a fatigued mind to want to start a task that requires our energy. 3. A scattered mind makes less effective choices. There is a lot of information to sift through when designing the healthy life we want for ourselves and family. When our mind is not focused, it can be overwhelming to choose which area to work on first or the hardest. We can’t assimilate information as well or make the best decisions either as to which strategy can work best for ourselves within our time allotments or budgets. 4. An over-stimulated brain does not read situations as they are. If one is jumping from one Instagram account or Facebook entry or TV show displaying “the perfect life” and the comparisons start to set in, an overstimulated mind with these messages cannot assess well what is real and what is not. It can create a negative film to play in our heads about ourselves that probably is not even true! Here is an interesting take on this phenomenon. If you can create a more calm and focused mind (even under pressure from various demands), and I know that you can, you will be more equipped to set many goals including health and fitness goals and focus well on achieving them. You will then have that roadmap to be more productive and therefore have more time to do things that are healthy for your body and mind. And it only gets better from there. You’ll then feel good about yourself and positive emotions are health promoting as well. It is a giant health-promoting snowball of sorts and I do believe we all are able to improve our organizational abilities that can lead to so many better things. First and foremost, before you can consider any other actions to take to create a focused mind, unless you can dial back the negativity playing and decompress your emotional reactions of worry, anger, frustration to name a few, you won’t be able to accomplish much. Too much negative messaging shuts down your mind to a more positive direction or at least your ability to strategize for the life you want to have. So, first, check in with yourself and see what roadblocks are there and work on those. Don’t miss this: Here is a plan to lessen your anger that can be taking up too much space in your life and here are four positive calming practices you can take to quiet your mind. Distractions and stresses are inevitable. But, rather than mindlessly succumbing to them, stop and use your intuition, your judgement and other senses to assess if that is urgent enough to bump out the other activity you were engaged in (hopefully your walking routine, bike ride with family, cooking a healthy dinner or even relaxing and gazing at the stars). Think first before you allow something to interrupt you. Can you come back to it later? Is it really more important than what you are doing now? Give yourself permission to turn off the phone or only check email and social media twice a day to keep your distractions from all the beeps minimized. You could even create a special ringer for your children’s calls or other important people that you can answer for if there is an emergency to soothe your worries about not answering all phone calls. 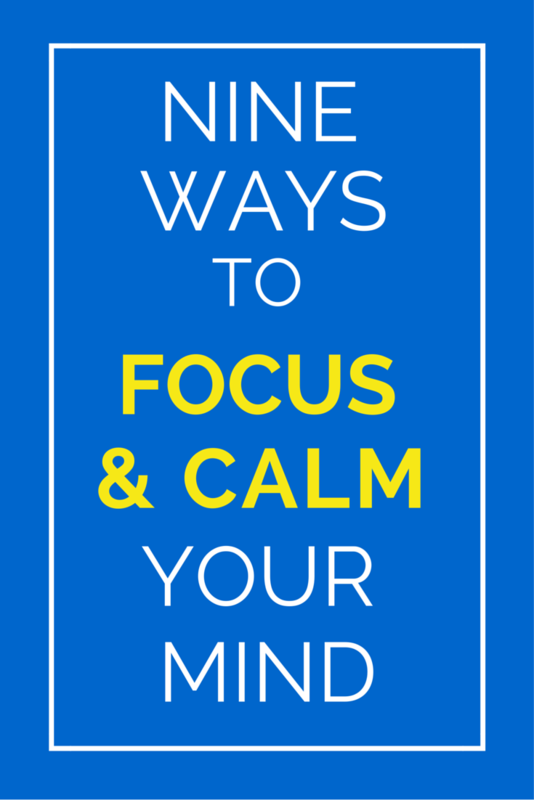 Don’t miss this: Check out these great ways to relax if you have a hard time unwinding. 3. Don’t reach for a button all the time. Have we all gotten a tad lazy always relying on technology to do the remembering, finding our way to a new location or recalling a title? Do try to put the gadgets down sometimes and work your brain! Read a map, memorize a quote, create a mnemonic aid to remember a long list and be a little more independent of all the buttons to push to go about your day. Don’t miss this: Memorization techniques that may help right here. I talked all about the importance of our social lives before on our health. You don’t need to be an extrovert at all to create a great social life that you enjoy and suits you. And you don’t need to be Martha Stewart either. Try to get an impromptu gathering going with little effort and use that social side of your brain to stay sharp in conversations, learn something new or feel more connected to others around you. Besides, connecting with others promotes brain development such as intuition, thinking, and empathy, too – all health promoting for our brains. Don’t miss this: I have loads of ideas to get your social side ignited. The great news is that many of the same things that improve your overall health can improve your mind, too. We all know how great regular exercise is for us. It produces better circulation and more oxygen to the brain and it creates nerve cells that create those much needed synapses in there, too. And, don’t forget the mood-boosting effects that many studies show regular exercise has as well. Don’t miss this: Here is how I created an inexpensive home gym. Creating more synapses in those brain cells can come in the form of learning so many different things: reading a challenging book, learning a new language, or even playing games regularly like chess, Scrabble and cards. They activate strategic, spatial, and memory parts of the brain, and require you to socialize, which can help form new neural pathways too! Make it a goal to choose one new area that you want to learn more about and devote a bit of regular time to it. Don’t miss this: Learning new things gives you something to talk about and connect about with others. Here are some other ideas to be a more interesting person, too. Even if you can’t sing well, you can at least hum a mood-boosting tune. Or, learn to play an instrument or practice the one you have. But if any of that does not appeal to you, simply listening to music regularly is stimulating to the brain. Many studies have shown that children who play an instrument have higher IQs and older musicians score higher on cognitive tests as well. Don’t miss this: The effects of music on your health are great. Check out what simply listening to music can do for you and your family. 8. Aim for quality shut-eye. Rest is key for our bodies and brain. They both need a break from working so hard all day and sleep is when our bodies restore our bodily systems as well. Good quality sleep can be elusive for many (present company included) but it is important to get the 7-9 hours a night. Don’t miss this: Dive in the cherry bowl for a natural and effective sleep aid. Change up your routine, your environment to stimulate your brain and emotions by traveling to new places. Whether that is even to a new local spot, I count that as travel, too. It is new and different and it is all good for the brain and state-of-mind. It keeps you flexible, you learn new things, see how differently others live and how they spend their time, try new foods, experience different weather or terrain and customs – the list is endless! Just make sure to do it and put some money aside to take even a day trip now and then. Don’t miss this: Let me take you through the steps to make those travel dreams actually happen. Below is Part 2 Of How To Stay Laser-Focused And Calm Your Mind . . .
Now that you are up on the impact your degree of a focused mind can have on achieving your health goals from Part 1, How to Stay Laser Focused and Calm Your Mind and you have seen some actions to take to improve it, please don’t stop there as I have more! Check this out! 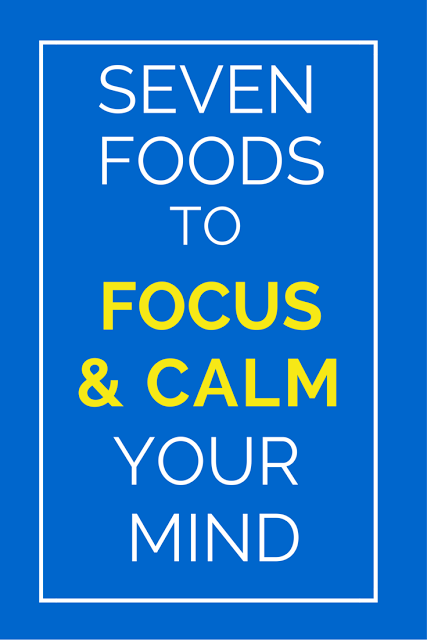 Here is another tool to help you get more focused as well: the food on your plate! It’s true that the food choices you can make may make a difference in how sharp you stay and how chill you are. Scan on down to see what I mean. 1. Feed that power organ. The brain requires and consumes an immense amount of energy so it makes sense that a healthy diet can ensure it has what it needs to keep you functioning at our best all day. Ever notice how the lunch room at a school cafeteria gets louder after the children have eaten? The food they ate just fueled their energy! I often see that on days I don’t necessarily feel that hungry and may I skip a meal, my tummy may not notice, but my brain sure does. I frankly just don’t feel as sharp and with it when I have not eaten in a while! The food choices we make can slow down the aging process of our brain and keep it sharp according to many studies. Two diets are specifically mentioned often: the DASH (Dietary Approaches to Stop Hypertension) diet and the Mediterranean diet. It is probably not a coincidence that both contain lots of vegetables, fruits, some fish, nuts and healthy fats. Stick to those for a healthy, long-lasting brain function. Don’t miss this: Here is what a day of eating the Mediterranean Diet looks like and tastes like with recipes too. 3. Sugar and how fast it is released is key. Foods with a low glycemic index number (more on that below) gradually release glucose into the bloodstream. That is a good thing! This gradual release helps minimize blood sugar swings that can make your energy dive south. Low glycemic foods optimize your brain energy and ability to create a focused mind by fueling it longer and steadier. 1. Indulge in dark chocolate. Loads of studies show that high consumption of cocoa flavanols improve our health in so many ways and that goes for our brain health, too. And, don’t forget what it can do for your mood. It is a great mood elevator to make the day seem a bit better and make those snags we all tend to hit, not such a big deal. Don’t miss this: You want to do this right! Be sure to check out how to cook with chocolate the right way with the right kind! 2. Choose super green matcha tea. Many love the nice, even energy that matcha green tea can give without any kind of coffee jolt. It is loaded with all the health benefits of green tea too. In fact, I call it green tea on steroids. Don’t miss this: A great introduction to Matcha. If the matcha tea is not your thing, try some peppermint tea. Yes, no caffeine, but the scent alone can stimulate and awaken! Don’t miss this: How to brew herbal teas the right way. There are a few tricks to it. 4. Over your breakfast grains, berries are a tasty choice. You are not going to skip breakfast, right? Right? Remember: it fuels you all morning with an even stream of brain power. Consuming more darkly pigmented fruits like blueberries and strawberries which have a low glycemic rating, says studies may reduce the risk of Alzheimer’s, but even more: eating them can actually strengthen your focus and memory several hours later. Check out more low glycemic foods here. Don’t miss this. Check out my healthy morning routines pinboard and follow it for great ideas on how to start the day off right. 5. Hydrate and make it pretty. Throw in some color to that filtered water. Dehydration is a sure energy zapper and headache-producer and overall bad thing. Don’t miss this; My ridiculous 25 reasons I reach for a squeeze of lemon in my water most mornings. 6. Rummage for seeds and nuts. Those tiny bitty seeds and nuts pack in the power. Try a handful of them for snack time, over your pancakes or breakfast grains, in a salad or just about anytime. Walnuts especially carry some brain-boosting powers, says this study. 7. Bake or broil your fish for more brain cells. Eat fish once a week for a bigger brain and more focused mind, says this study! And, well . . . who doesn’t want more of that? Don’t miss this: Stay informed on how and what fish to buy. Some are good for your health, and some are really not. 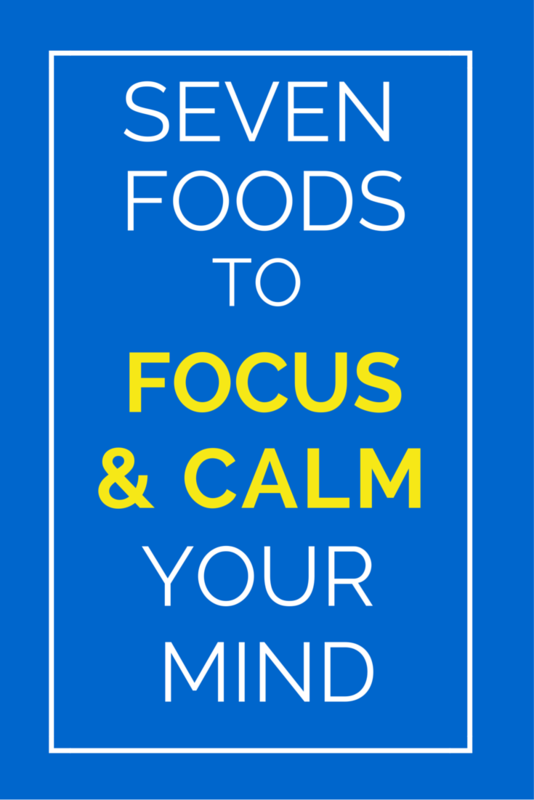 Do you find the food you eat affects your focus? Or the time of day you eat it? Jump in and let me know your experience with food and focus. I agree that a focused mind plays a critical part in creating a healthy lifestyle. When we are scattered and unfocused we can't accomplish as much as we want to. I have certainly learned that the hard way in my own life so thank you for sharing your valuable and empowering healthy lifestyle insights with us at the Healthy Happy Green and Natural Party Blog Hop. I'm pinning and sharing. Always enjoy hearing your comments, Deborah. You make such good points and I appreciate you taking the time to share such thoughtful ideas. Kind of you to say so, Kathleen! Thanks very much. This was definitely me last week. My todo list was overwhelming, so instead of freaking out about it I changed my routine and sat in on a guest speaker in my second graders class (Jasper the Therapy Alpaca). Thanks for sharing on the #HomeMattersParty . I hope you will join us again next week. A guest speaker can really inspire us! Thanks for giving us an important perspective, Audrey. I went through some stress last week and my immune system paid for it. I am working actively on being mindful because I need all the energy I can save. Stress does affect our immune system – no doubt! I hope you are on the med soon, Debbie, and do take care of yourself! Thanks, Gingi! That means a lot! Glad it resonated with you, Launna. And all that walking you do sure is great for the mood and clears your mind! Thanks for letting us know your experience with it.